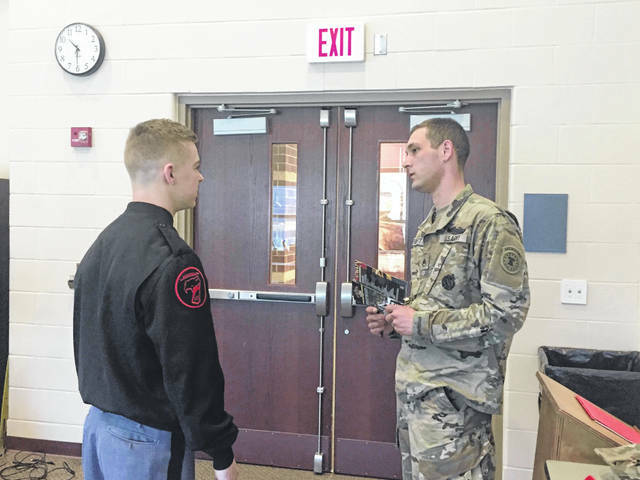 West Point Military Academy Cadet Luke Purdy speaks with local Army recruiter Sgt. John Burnett after Purdy spoke with student at Portsmouth High School Tuesday morning. 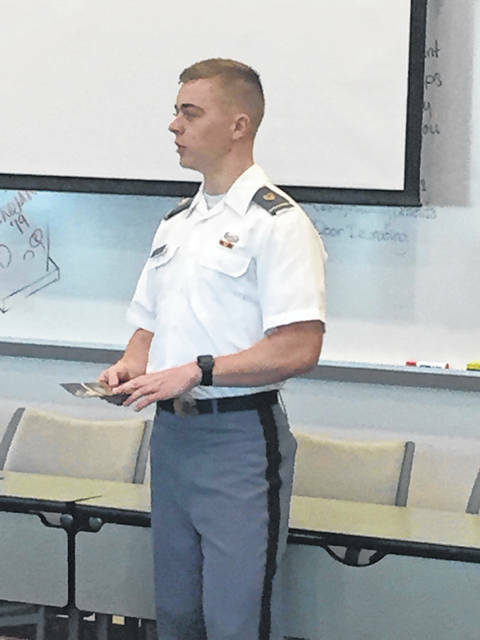 For West Point Military Academy Sophomore Cadet Luke Purdy, his education and career choice was an easy one. A Cadet begins with a seven week Basic Training in which they perform the duties of training to be a soldier. Then, Purdy said, they go to the classroom and study their selected major just like any other college student. “We do our military training in the summer,” Purdy said. He noted that when a Cadet gets to be a junior and into their senior year, they have to choose a division of the Army to serve their required five years after graduation. For Purdy, he is leaning towards the Armored Division. But at this time Purdy is focused on his degree in Business Management with a minor in French. He told the students Tuesday one of the benefits of being a Cadet is Next year he will study in France for six months. While at PHS, Purdy done his testing and interviewing, as well as a physical and eventually, not only did he receive one appointment but two. Both Congressman Brad Wenstrup, as well as Senator Rob Portman appointed Purdy to West point. In order to be accepted to West Point, a Congressman or Senator must first give you the appointment. Each year, West Point has about 11,000 applicants of which only about 10 percent will be accepted. Upon graduation he will become commissioned as a United States Army Second Lieutenant. He said after his five year commitment he could see himself staying in for a longer period. In talking to the students, Purdy said although it is a very challenging step in a teenagers life, it is well worth it in the end. “It’s a lot of hard work. A lot of dedication,” he said. “Don’t give up. It’s challenging, but it’s rewarding. He passed out three brochures from West Point at the beginning of his talk. In the brochures one covers the military academy’s Summer Leadership Experience. This enables students to better understand what the academy has to offer including academic, athletic, military and social engagement. While there, the potential Cadets will get the opportunity t interact with West Point Cadets. Another brochure describes what West Point is. It also has statistics to share such as of the 1,150 cadets admitted, 83 percent are men and 97 percent were involved in varsity athletics. The four facets of a West Point education are academic, physical, leadership and character, according to the brochure. The last and quite possibly the most important brochure is the steps to admission to West Point. The first step is to open an application at www.Usma.edu/admissions; the second step is to apply for a Congressional nomination which starts in the spring of a students junior year in high school. A Congressional nomination provides West Point the legal authority to offer admission to the academy. Third is completing online forms which will include school transcripts and SAT and ACT scores. Fourth, complete testing which included medical and physical. Purdy told the students if they are turned down not to give up. He said initially he was declined admission and eventually was accepted. 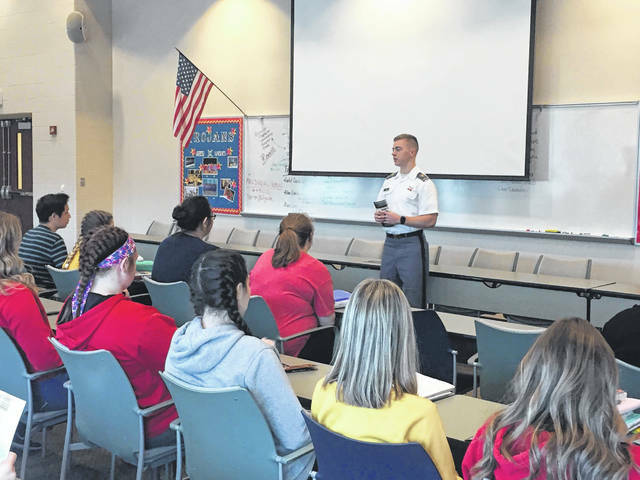 https://www.portsmouth-dailytimes.com/wp-content/uploads/sites/28/2019/03/web1_Purdy-3.jpgWest Point Military Academy Cadet Luke Purdy speaks with local Army recruiter Sgt. John Burnett after Purdy spoke with student at Portsmouth High School Tuesday morning.